Bring in a toy for the less fortunate children in our community and we will donate $5 on your behalf! Until December 14, Dobson’s is partnering with Toys for Tots to make a difference in our community. 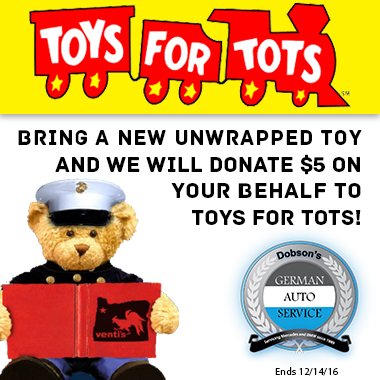 From November 1st until December 14, we will donate $5 for each toy brought into to Dobson’s German Auto Service on your behalf! Help us make a difference this holiday season. Click here for the Toys for Toys website. Join us to Feed the Hungry! 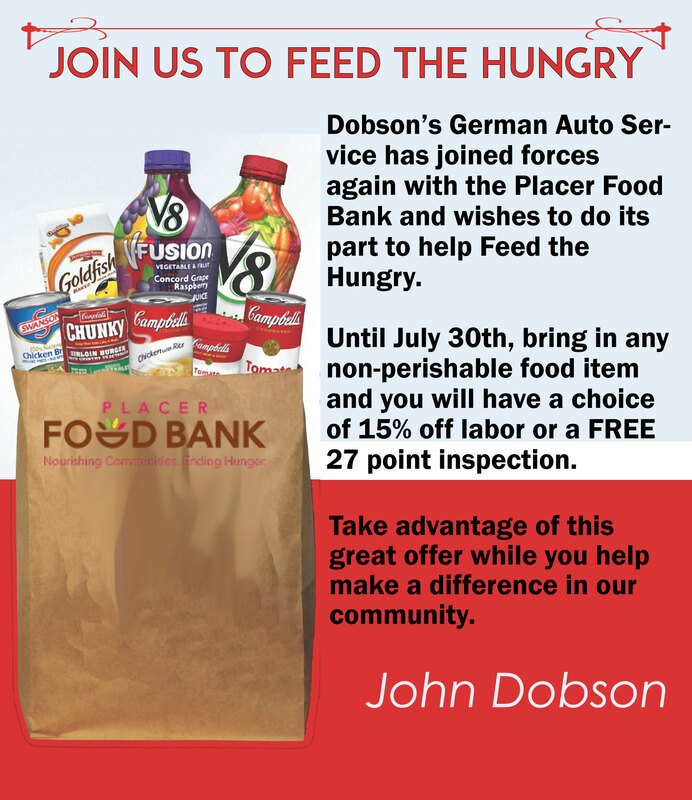 For a second year, Dobson’s German Auto Service has joined forces again with the Placer Food Bank and wishes to do its part to help Feed the Hungry. Until July 30th, bring in any non-perishable food item and you will have a choice of 15% off labor or a FREE 27 point inspection. Take advantage of this great offer while you help make a difference in our community. 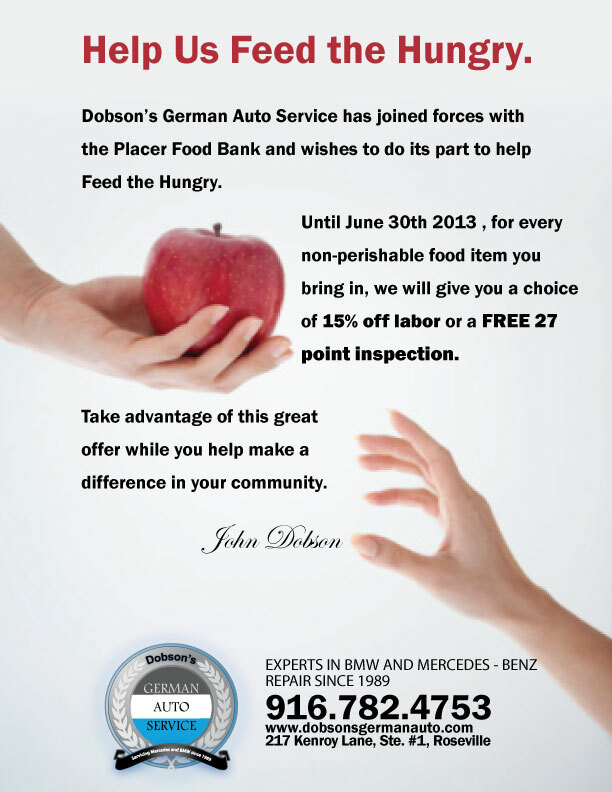 Thank you for participating in our promotion with the Placer Food Bank. The promotion was extremely successful. Hundreds of non-perishable food items were gathered and delivered to the Placer Food Bank. Until June 30th 2013 for every non-perishable food item you bring in, we will give you a choice of 15% off labor or a FREE 27 point inspection. Dobson’s German Auto Service sponsored the first annual Run 4 Ralph 5K race. The event took place on April 20th 2013. Run4Ralph supports the Albie Aware Breast Cancer Foundation. Baker and his wife overcame cancer together. Many joined Ralph in saving lives and empowering people with breast cancer through awareness, education and support.